The 10th Annual Thanks To Yanks Tribute 9/11 Dinner is now open for registration. This free dinner on September 11, 2016 from 5:00 pm – 7:15 pm at the DoubleTree by Hilton, 11 Beaver Street, Milford, MA 01757 is for military members, veterans, their families and emergency response personnel. This non-political event is to simply an attempt to say "thank you" for the sacrifices they make in order to ensure our freedoms and safety, and remembering the heroes and victims of 9/11/01. 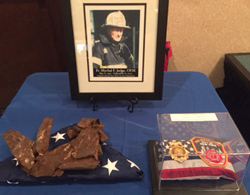 The first tribute dinner hosted 120 guests and has continued to grow each year with 425 guests in 2015. This event recognizes all military members, veterans and their families, including Blue and Gold Star families. Registration is required for the event as seating will be limited and can be done at www.thankstoyanks.org. Thanks To Yanks, is a non-political 501(c)(3) organization whose mission is to support military members, veterans and their families. Founded in 2006 as a onetime 9/11 Tribute Dinner to recognize the sacrifices military families endured in response to the attacks, Thanks to Yanks has become not only an annual event, but also an all-volunteer organization that provides resources, connects the community with programs and identifies gaps in service to maximize support of our military and veterans. For more information or to donate, please visit www.thankstoyanks.org, Facebook, Twitter, LinkedIn and Instagram. Thanks To Yanks president and founder, Michael Shain said, “We are proud to provide this dinner to our military members who have done so much for our country. It is Thanks To Yanks’ mission to support and provide resources to military members, veterans and their families.